Hamas' deputy leader Salah Al-Arouri, considered the most wanted terrorist, to attend meeting of group leadership in Gaza. The leadership of the Hamas terrorist group will convene late Friday for a rare meeting, officials said, amid speculation of a long-term truce between the rulers of Gaza and Israel. A senior Hamas source, speaking on condition of anonymity and quoted by AFP, said the leadership would meet in the evening in Gaza City to discuss a number of issues, including a possible agreement. It will be the full first meeting of the movement's political bureau since talks held in Cairo in 2017, officials said. 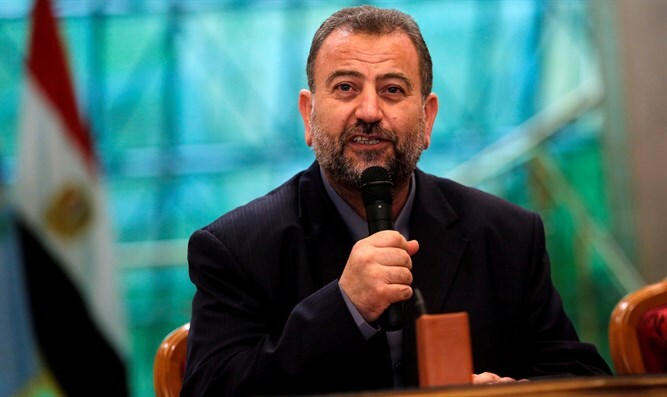 Among those attending will be Hamas' deputy leader Salah Al-Arouri, who crossed the border from Egypt on Thursday with eight other Hamas leaders based outside Gaza. Arouri, who lives in Lebanon and has never before visited Gaza as he is considered the most wanted Hamas terrorist, was given Egyptian and United Nations assurances over his safety, the Hamas source said. Prime Minister Binyamin Netanyahu on Thursday delayed a planned visit to Colombia amid speculation that a truce agreement could be reached within days. Such a deal would involve a long-term cessation of hostilities between Israel and Hamas in exchange for a significant easing of the Jewish state's economic blockade of Gaza, according to Hamas and UN officials. Earlier on Friday, the family of Shaul sent an angry letter to the Prime Minister and the Diplomacy and Security Cabinet over reports of the planned truce with Hamas. The family warned that any accord that does not include the return to Israel of Shaul and Goldin, as well as Avera Mengistu and other Israeli citizens being held by Hamas, will eventually backfire.